Email is a fundamental component of any online marketing strategy. Companies rely on email to acquire new customers, nurture existing relationships, and build customer loyalty. Previously, email campaigns consisted mostly of bulk emails such as newsletters and offers, however our expectations for email communications have risen in recent years: they should feel like relevant, useful conversations, not spam. Email marketers are constantly experimenting with different email strategies to find the ones that best connect with their customers and drive them toward their goals. For example, they might compare the effectiveness of two different onboarding email campaigns in getting trial members to subscribe to a paid plan, or they might see whether tailoring a campaign to two customer segments (e.g., hobbyists vs. enterprise clients) has a greater ROI than one campaign targeting both segments. One problem with this process of manually optimizing email strategies is that it’s extremely time consuming and expensive. Testing email strategies means creating new email configurations, randomly assigning customers to these configurations, monitoring their behavior on your site (or in your app), then choosing a winner. And this process never ends: once one configuration is shown to be better than another, one must ask whether an as-of-yet-tested campaign might be even better than that one. A second problem with this manual optimization process is that it’s prone to error. As a team of cognitive psychologists and neuroscientists, we’re the first to say that while humans are incredibly intelligent, our decision making processes can be relatively slow, prone to biases, and limited in its parallelization. This can make optimizing email campaigns along their many dimensions — including message timing, content, and personalization — a difficult challenge for even veteran marketing experts. The ubiquity of emails in our online lives — combined with these problems in figuring out how to make email campaigns most effective — motivated us to build Optimail. Rather than relying on manually tweaking email campaigns, Optimail offers its users the opportunity to continuously and automatically optimize their email campaigns using artificial intelligence. Marketers can simply draft the emails they want to send (or many versions thereof), define the goals they want these emails to achieve, then sit back and watch as Optimail learns the strategy that drives customers most effectively toward those goals. While some emails we receive are ‘transactional’ in nature (e.g., a receipt for a purchase, a tracking number for a package we are sending), Optimail works best for campaigns that have an inherent flexibility in the content and timing of their messages, for example, promotional campaigns for customer acquisition, onboarding campaigns for new customers, and retention campaigns for current customers or customers who have churned. These campaigns give Optimail the freedom to explore with different kinds of messages and message timings to find what works best. We first piloted Optimail with a personal productivity startup called Checkli, founded by a seasoned marketer who had led two prior startups to successful exits. Understanding the importance of onboarding campaigns, he had designed an email campaign for new users at Checkli to encourage them to explore its different features, download the iOS app, share the app with their friends, and personalize it to their own tastes. As a first test of Optimail’s technology, we asked whether it could optimize the delivery rate and timing of these emails in order to boost engagement with Checkli’s web app and iOS app. Would Optimail drive engagement higher than Checkli’s existing email campaign, without any manual intervention at all? To begin, we simply copied Checkli’s current emails into a new Optimail campaign. We then defined several goals that we wanted the campaign to drive customers toward: logging in to the apps, creating new checklists, completing tasks, and sharing the app with friends. Of course, we not only wanted Optimail to promote those actions — we also wanted it to discourage other actions, such as unsubscribing from Checkli’s emails (thus muting their marketing efforts forever). We took half of Checkli’s new users and subscribed them to the Optimail campaign. We left the other half of users in the regular campaign. What we found after just two months of this experiment was that users subscribed to the Optimail campaign had 25% more engagement with the app while receiving 20% fewer emails. Optimail not only made the campaign more effective in driving app engagement, it was more efficient because it required fewer emails to do so. Encouraged by our results with Checkli, we shifted development of Optimail into overdrive. We built several new features. First, we added segmentation. We know that there are sometimes fundamental differences between your customers that need to be considered when creating your email campaign. For example, one sequence of emails may work well for hobbyists but fail for enterprise customers, and vice versa. By allowing you to indicate whether new customers are in one of these special segments, Optimail can learn to tailor your campaigns even more effectively. Next, we added rules that allow you to specify constraints on Optimail’s exploration of email strategies. These rules will be familiar if you’ve ever built a standard drip marketing campaign. For example, you might specify you want a ‘welcome’ email to be sent on the first day of your onboarding campaign. Critically, Optimail can be configured not to just send one welcome email, but to test multiple versions of this email to determine which one works best. We also added customer-based rules that constrain emails based on customer properties (e.g., their user segment), action-based rules that constrain emails based on customer actions (e.g., whether or not they have performed some action on your site), and email-based rules that relate emails or email groups together (e.g., if Optimail has sent a ‘coupon’ email, don’t send another coupon email offering the same discount). Third, we added apps that enable new channels of messaging beyond email. Email is simple and effective, but reaching out to your customers in other ways can sometimes provide a much-needed boost to your campaign’s effectiveness. The first app we are launching with Optimail is for Intercom. It allows our users to send Intercom messages (either in-app or via email) alongside the regular emails in their Optimail campaign. We’ve found huge value in these applications, and more are on the way! Optimail as a platform consists of two broad components. On the one hand, we have the algorithms that learn about customer behavior and tailor our users campaigns. 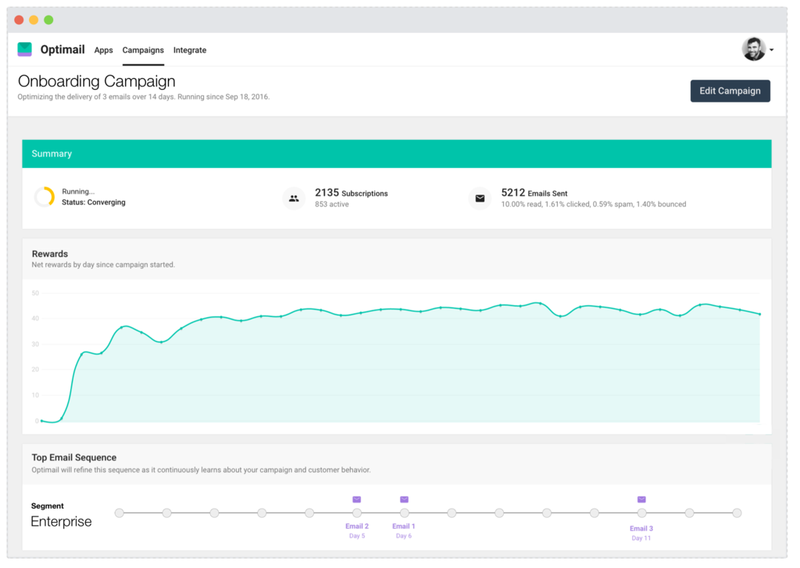 On the other hand, we have the application that allows our users to manage and monitor their campaigns as well as exposes an API for integrating Optimail into their apps. Most of Optimail’s decisions in tweaking email campaigns are driven by reinforcement learning algorithms. Reinforcement learning is a subfield of machine learning dedicated to the learning how to interact with the environment. It’s the same kind of technology that allows a robot to escape a maze, or to beat master players at Go. Learning from messy human behavior, however, turns out to be quite tricky! We therefore combine asynchronous reinforcement learning algorithms with non-linear function approximation that accounts for behavioral heuristics to reduce convergence time. Through extensive (and ongoing) testing, we find that our algorithms are highly effective at optimizing many kinds of email campaigns. Underlying the API and the Optimail dashboard is a Laravel app with a Postgres database and a frontend single-page Angular app. Everything’s hosted on Heroku, and the app and algorithm communicate through a combination of custom API calls and messaging services. On Friday, we launched Optimail into private beta. We’ve given a select number of users access to 3 months of Optimail in exchange for feedback on what makes Optimail work for them, and what could be improved in future releases. We’re already sending out thousands of emails per day, and hope to be sending tens of thousands by month’s end. Our big vision for Optimail is two-fold. First, as more and more organizations use Optimail to optimize their email marketing campaigns, we plan to keep improving our algorithms. In the process, we’ll be making email marketing more effective for our customers, and more engaging for theirs. Second, we want to build on Optimail’s founding principle — that AI can solve problems for organizations of all sizes — to build new products beyond email marketing. Imagine an ecosystem where everyone from startups to Fortune 500 companies can leverage the power of AI to connect with their customers and growing their businesses. Want to try Optimail yourself? We’re still taking applications for our private beta: go to Optimail’s site to request beta access. We are reviewing every application and will reach out to you as soon as possible!